Held annually on 5 October since 1994, World Teachers’ Day commemorate the anniversary of the adoption of the 1966 ILO/UNESCO Recommendation concerning the Status of Teachers. This Recommendation sets benchmarks regarding the rights and responsibilities of teachers and standards for their initial preparation and further education, recruitment, employment, and teaching and learning conditions. The Recommendation concerning the Status of Higher-Education Teaching Personnel was adopted in 1997 to complement the 1966 Recommendation by covering teaching and research personnel in higher education. Trained and qualified teachers are fundamental to the right to education. World Teachers’ Day is co-convened in partnership with UNICEF, UNDP, the International Labour Organization, and Education International. 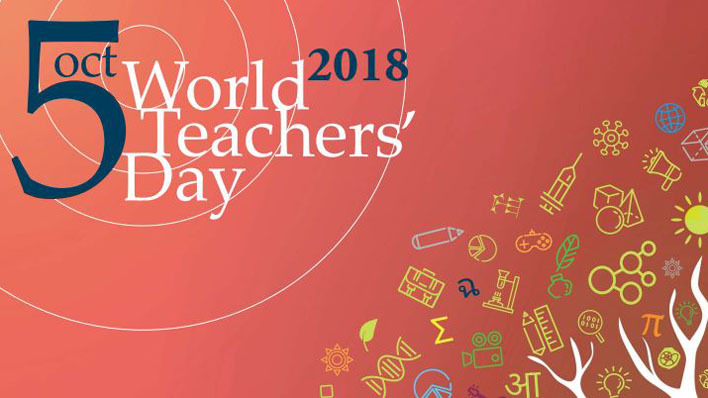 Joint message from UNESCO, ILO, UNICEF, UNDP and Education International "On this World Teachers’ Day, as we celebrate teachers’ important contributions to improving the lives of children and youth around the world, we reaffirm our commitment to increasing the global supply of qualified teachers. We urge all governments and the international community to join us in this endeavour, so that all children and young people, no matter their circumstances, can secure their right to quality education and a better future." Downlad the full message in - English, French, Spanish, Arabic, Chinese, Russian.